Most commercial refrigeration equipment consists of a compressor and a condenser, outside the cold box, and an evaporator inside. The refrigerant travels in a circuit into and out of the area to be cooled, which is usually within an insulated compartment. This compartment can range in size from that of a common refrigerator interior to a walk-in cubicle as in a restaurant, to a whole air-conditioned building. The refrigerant is compressed outside the area to be refrigerated. In the process it is squeezed so as to occupy a smaller volume. Because it contains the same amount of caloric heat in a smaller volume, the temperature is suddenly made higher. Still under greater pressure and occupying a smaller volume, the refrigerant travels via pipe to the inside of the area to be cooled. It is forced through a diffuser, which consists of a pin-sized aperture, causing the pressure to drop instantly. Now the refrigerant expands to occupy a greater volume and as a consequence its temperature drops, so it becomes much colder. The refrigerant typically passes through finned piping resembling an automotive radiator, and the coldness transfers to the interior of the box, whereupon the new warmer and less pressurized refrigerant journeys back to the compressor to begin another cycle. China's food refrigeration uses a vapor compression refrigeration system. In a broad sense, this refrigeration system should include refrigeration cycle system, cooling water system, lubricating oil system, indirect cooling, and refrigerant circulation system. The refrigeration effect is achieved by the joint action of these parts. The refrigeration cycle system is the most important in these parts. The so-called refrigeration system is often the refrigerant circulation system. According to the type of refrigerant, the refrigerant circulation system can be classified into an ammonia refrigeration system and a fluorine refrigeration system. 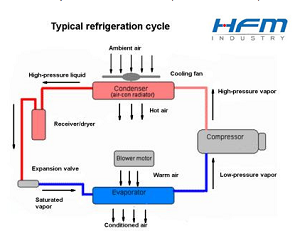 The refrigeration principle of the refrigerator is that the compressor compresses the working medium from low-temperature and low-pressure gas into high-temperature and high-pressure gas, and then condenses into a medium-temperature and high-pressure liquid through the condenser. After the throttling valve is throttled, it becomes a low-temperature and low-pressure liquid, so that the refrigerant restores the ability to evaporate heat. The low-temperature low-pressure liquid working medium is sent to the evaporator, which absorbs heat in the evaporator and evaporates into low-temperature and low-pressure steam, and is again sent to the compressor to complete the refrigeration cycle. The heat exchange equipment used in the cooling room, freezing room, refrigerating room, cold storage room, ice making room and ice storage is: cooler, waste heat exchanger, shell-and-tube water heat exchanger, evaporator, condenser and so on. The temperature in the cooling compartment is generally maintained at 0-2 °C. 1) L-level preservation library. Mainly used for storing fruits and vegetables, eggs, medicinal materials, fresh-keeping and drying; the temperature of the food into the warehouse is +30 °C; the temperature of the cold storage is generally +5 ~ -5 °C. 2) Class D refrigerator. It is mainly used for storing meat, aquatic products and products suitable for this temperature range; the temperature of the food into the warehouse is +15 °C, and the temperature of the cold storage is generally -5 to -20 °C. 3) Class J low temperature library. Mainly used for storing ice cream, ice cream, low-temperature food and medical supplies; the temperature of the food into the warehouse is +15 °C, and the temperature of the cold storage is generally -25 °C. For ammonia cooling and fluorine cooling, the plate can be selected from SS316.